It's very definitely a bad hair day today and will be till I hear from DIL about a cut, colour etc. Long overdue. Not only is it a bad hair day, but the photos are not good either. I find taking photos of hats etc very awkward and am never satisfied. It's been a fairly stressful week and the stress is showing in my face and skin. Little sleep hasn't helped either. The beret is an attempt to cover the bad hair! 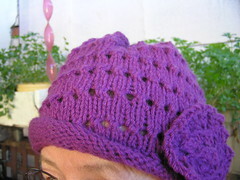 This beret is much slouchier, if that's a word, than the first one I made. It's made in 12 ply and as the label shows is partly prefelted. The wool seems to come in two thickish strands and looks a bit like the merino/possum wool mix. It's soft and easy to knit. I had a pattern sort of worked out in my mind and then had a look at the tension on the ball band and took fright. I upped the number of stitches to cast on. It seems I was right in the beginning with my own idea. The beret went on, but felt loose and I thought it would slide around my head with any movement. I didn't relish pulling it all back, so picked up stitches around the cast on edge. i spaced these out, a bit like applying ribbing to a sewn T-shirt. Measured the edges and divided into quarters. I cast on a quarter of my stitches in every quarter of beret already completed, did similar number of rows as original ribbing and turned it to inside and hemmed new ribbing down very loosely. Voilà, it worked and now fitted comfortably. of course the double thickness helped, but I think it also needed the reduced number of stitches. 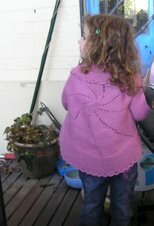 I used just over two balls of the wool which was nice to knit, soft and non-splitty. I bought it at Lincraft in the city. I'd gone in to get my hearing aid fixed and decided to investigate their sale. There was a lot of yarn I would not buy as it was feathers and other acrylic stuff which makes my hands ache quite badly. I had no real plans so wasn't looking to spend up big. However I bought this, some 8 ply for another hat, and some Sullivan's sock wool, black, black, black. This is for a pair for myself to satisfy Miss Seven. When I was last at her place, I wore navy trousers, black shoes T-bar shoes and handknitted socks of a royal blue colour. She took me to task. "Grandma! You really need someone to help you get dressed! Those socks do NOT go with those shoes. Don't you have any black ones?" She actually wasn't being cheeky to me, just concerned. She has a good dress sense and is usually well co-ordinated herself, although I would have liked a picture of her at two years, winter clothes, blue denim sunhat and a hand me down pink satin Barbie nightgown over the top. I used to mind her and she wore this combination all day! I've just turned the heel on the first sock which I started yesterday afternoon. The wool has been mostly good, much better than I expected. However there was a patch about 30 cm which was rubbed thin and unravelling and had a knot in it. There was only one remedy for that, a break, cut out the offending part and join in new end. Oh, one other gripe. The band says 120 gm but gives no idea of length. I've also finished a pair of toddler socks for a friend's little boy. However, I had downloaded the latest lot of photos before I even remembered that they should have been photographed. BTW, I love my mirror, although the photo is poor. It works well either vertically or horizontally. The wood is old, from Maitland original hospital which was demolished some time ago. I bought it for about $50 at Paddington Markets about ten years ago. That is indeed a lovely mirror!